Our last day was a day at sea and we thought we would go sit by the pool. NOT! Every lounge chair was taken so that was out. We finally did find two lounge chairs on the Serenity deck but there was absolutely no breeze at the back of the ship and we felt like we were strips of bacon in a frying pan so only lasted maybe 20 minutes. We spent most of the day just hanging out and enjoying different things on the ship and discussing the pros and cons of this cruise compared to the other two we have taken. 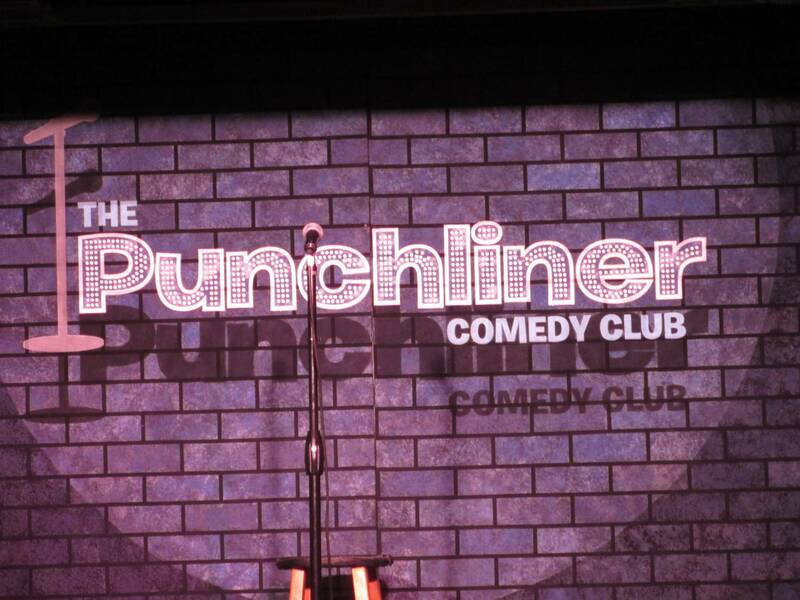 The Punchliner Comedy Club was by far our favorite entertainment of the cruise. We just loved the comedian Chris Wiles and he had me in tears during two different shows. The other comedian Eddie Clark was very good as well but there was just something about Mr. Wiles that hit our funny bones a little more. 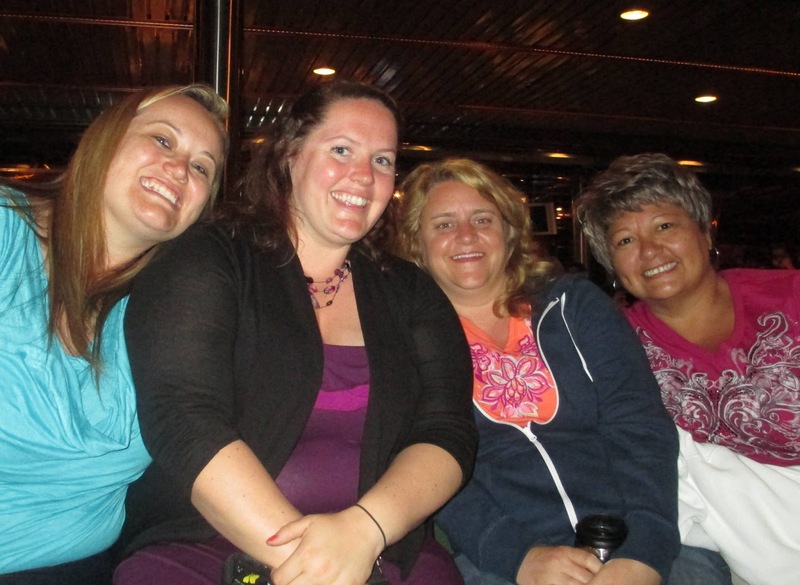 Our Utah gals, Ashley and Kacie, joined us the last night for the two adult comedy shows and a girl in front of us was nice enough to take a picture of all four of us. This will definitely have to be made into a scrapbook page! After the cruise Karen and I discussed our cruising experiences we have had in the last few years and made a few decisions. We have decided we like the bigger ships better than the smaller ones. We weren't disappointed with Carnival at all but just think bigger ships have more to offer. We feel like there has not been any service that can compare to the service we had on Holland America. We did like our room with Royal Caribbean the best, but then again we had a balcony then. 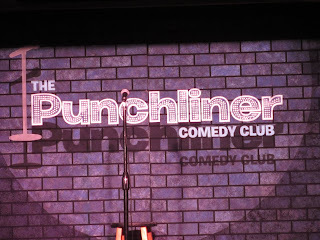 We decided The Punchliner Comedy club was our favorite entertainment of the cruises we have been on. Who we cruise with next is a mystery to us right now because we don't necessarily have a favorite line at this time but we do know we would like to cruise again. We prefer the Eastern Caribbean so far over other locations, this much we do know. We figure we have a whole year to decide what to do next so we aren't sweating it right now. We might actually start looking into an All-Inclusive vacation for next year. Eventually we want to go on an Alaskan cruise but that will likely be a few more years before we do that. I think all we know for sure at this point is that we do want to continue to do a vacation together at least once a year for the remainder of our lives...guess that is one thing that makes us BFF's! So glad you had a great time! Can I come with you guys to Alaska?? Thanks for the funny posts, I'm sure glad you got to be a contestant at the game show night! Fun! We have cruised with Holland America and it was for sure the best service we've ever had. They do a great job of the Alaska cruise when you are ready to do that. I hear the Disney cruises are pretty good..you could keep your comparing going with a new line...i know a great travel guy for anything Disney (they even have an alskan cruise. I'm going on my first cruise in May. Love to hear your feedback!